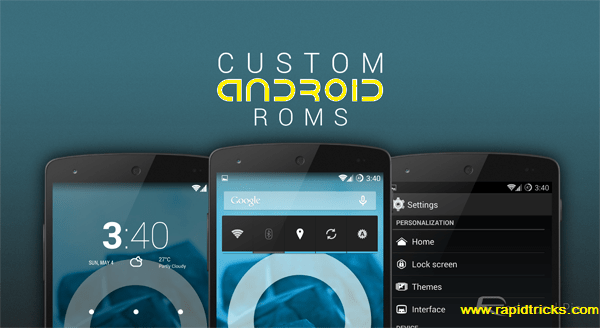 One of the top reason of Android’s Popularity is that we can install custom Rom in these phones. Everybody wants to customize their phone’s home screen but not every company allows users to do so but android allows you to do anything you want with your Android smart phone. Android allows users to replace their original operating system, users can install any ROM they wants. When a new version of Android is release in Android market then the company do not gives the new updates to old phones, but users wants to experience the new version on their old smart phones. So android gives them a chance to install any custom ROM they wants. Installing a Custom Rom on an android device requires many process such as you need to Unlock Bootloader of your phone, Install a custom Recovery (if you want to install custom ROM without PC or Laptop). Note: Custom ROMS may not functions properly and results in some errors in android phones. Install custom ROMS on your own risk, we are not responsible for any software or hardware damage to your phone. Note: To flash using fast boot you will need to unlock your phone’s bootloader. Download and copy custom Rom in External SD card. Now open phone in recovery mode ( (Press Vol up+Home+Power or Press Vol Down+Home+Power) simultaneously release these buttons when your phone boot in recovery mode). Now select option “Install zip from SD card”. Wait till Process is done. Now Click Reboot System Now.